Stone Barns Center in Pocantico Hill, NY is a non profit organization focused on creating a healthy, sustainable food system in America. In their mission is to transform the way America eats and farms and Stone Barns Center hosts and runs education programs for beginning farmers, convenes change makers for talks and conferences, and continually develops innovative agroecological farming practices on the farm. Stone Barns Center is a popular destination for New Yorkers and beyond and home of the internationally renowned restaurant Blue Hill. Our goal with a new web experience was to help establish Stone Barns Center as a leader in the agroecology space to the world beyond the NYC region. We launched a new digital experience for the organization with a focus on spreading awareness of their mission and work. As part of our partnership, we established a new digital identity, created a new user experience accounting for the unique audience segments, and replatformed the website on WordPress to allow the Stone Barns Center team to easily update and expand the website. 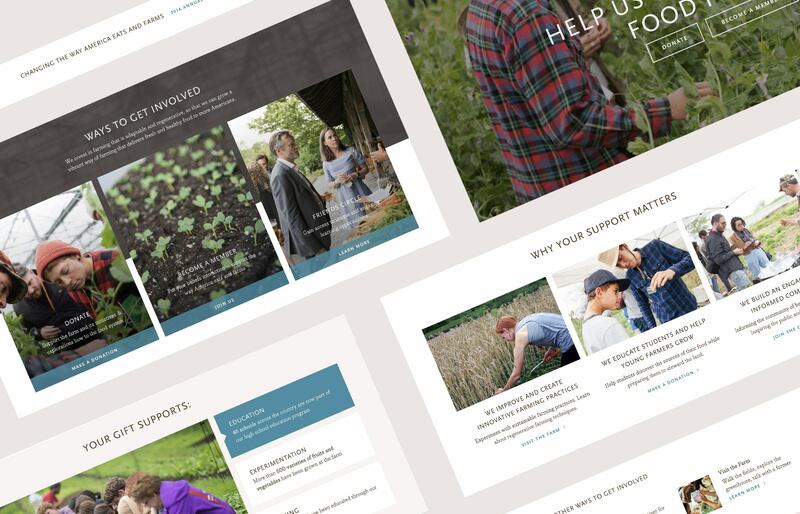 In order to streamline internal processes and improve data around visitors and donors of Stone Barns Center, we built a custom integration between WordPress and their CRM system. As part of our ongoing relationship with Stone Barns Center, we will continue to work together to optimize the site based on KPIs, grow additional content areas on the website with the goal of furthering education and increasing donations, and supporting the team on ongoing marketing initiatives. See the site in action at stonebarnscenter.org.